Abby has over eighteen years of experience providing services to adults with intellectual disabilities. She began her career with Harry Meyering in 2000 in the Intermediate Care Facilities as a DSP and transferred to the Semi-Independent Living Services and Supportive Living Services programs in 2003. In Semi-Independent Living Services, Abby started as a DSP, worked for twelve years as a Community Living Coordinator and moved into the Semi-Independent Living Services Program Manager role in 2015. Originally from St. Peter, Abby now lives in Mankato with her husband. They are avid consumers of science fiction and fantasy books, TV and movies. They enjoy vacations and gathering with family and friends, but in reality they spend most of their time trying (and often failing) to maintain the upper hand in their multiple-cat household. 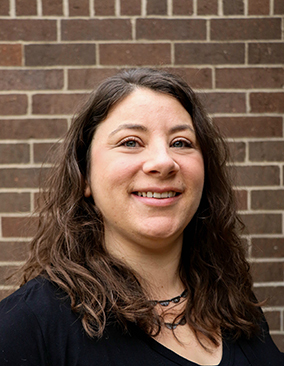 In addition to her work at Harry Meyering, Abby serves on the LEEP Board of Directors in the role of past president and is currently on several committees. She has done other non-profit volunteer and board work in the past including as a founding board member of For Pets, an animal welfare organization. Abby is a strong advocate for a person-centered approach to services. She enjoys helping others use their strengths to live successful, independent lives based on their own definitions. Abby continues to learn and grow in her career and is excited to see the progress of services for adults with disabilities, using her experience to take from the past and project into the future.